Human rights having gender connotations demand effective political aspirations of women for their implementation. The women's access of right to property, non-discrimination, education, equality, marital legal consequences cannot be established without just and rational law. That is why legislation from gender sensitivity is significant. Hence, a nexus between the effective political empowerment of women and protection and promotion of women's human rights is established. Much to our delight, in the 9th parliamentary election some 19 women have got elected and more importantly, in opposition to all traditions, four crucial ministries (excluding the Premier) have been placed under the women leaders' charge. This has paved the way for effective participation of women in the decision making process, which consequently would contribute to the economic empowerment of downtrodden women in Bangladesh and decriminalisation of politics. While these are some rays of optimism, in some cases tentative aspirations, there still are hundred miles to go. Especially the issue of reserved seats for women in parliament deserves detail analysis and rightful treatment. In the original constitution 15 seats were reserved for women. In order to retain the continuity of women's participation in politics, the reservation was further reinforced in 1978 and in 1990 and the number of seats was increased to 30. In 2004, by 14th Amendment to the Constitution, the number of seats was further increased and provisions were made for proportionate division of seats among the political parties according to their attained seats in Parliament. The debate still goes on about their mode of election. Formerly the women members to these reserved seats used to get elected by the Member of Parliament. Now 45 reserved seats are distributed as per the seats achieved by the political parties in the general election. In both cases the method is ex-facie contradictory to the basic tenets of democracy. Because, in earlier method only the winner took it all and in the latter method the achievement of popular vote is not taken into consideration. In 2004, Awami League got 9 women seats out of 45 as their share (AL refused to take it) though they bagged 42% of the popular vote. In the same line BNP would get 6-7 seats though they have got 33% support of the mass people. In fact, during the past decades, different women organisations have been demanding direct election for the reserved seats to enable them to represent the people and not the party in power. It is argued that with no accountability to any constituency, the provision for reserved seats restricts women's effective participation in the decision-making process as they only serve as the supporters of the majority party in the parliament. Another phenomenon is added from 8th parliament that the female reserved seats are being used as a camouflage for the non-politician (businessman) member of parliament to fulfill the quorum in parliament sessions. It is high time to think about the direct election or some more acceptable method of democratic representation in the reserved seats to ensure true political empowerment of women in Bangladesh. Apart from the lethargy of political stakeholders e.g. the parliament, government, political parties, unfortunately the issue has not secured a warmth treatment by the apex judiciary of Bangladesh. The constitutional validity of 10th Amendment requiring extension of 30 women reserved seats for another ten years was first challenged in 1990. In Dr. Ahmed Hussein vs. Bangladesh [44 DLR (AD) 109], it was held by the Appellate Division that as the provisions of reserved seats were in the original constitution from the outset, hence it is valid. It seems that there is a lack of appreciation of the fact that the issue of 'reservation' itself is limited and temporary. At least that was the intention of the framers of the constitution. When reality demands the continuance of such provision the judiciary should have to think how that reservation can be much more effective for advancement of women. The issue of 'reservation' was addressed by Justice TK Thomen in Indra Swahney (AIR 1993 SC 477) thus, “Reservation must not outlast its constitutional object and must not allow a vested interest to perpetuate itself….Every reservation founded on benign discrimination and justifiably adopted to achieve the constitutional mandate of equality must necessarily be a transient passage to that end. It is temporary in concept, limited in duration, conditional in application and specific in object. Reservation must contain within itself the seeds of termination”. It is submitted that in Ahmed Hussein, the Supreme Court lost an opportunity to show judicial activism in refraining from making observation on the evil consequences of indirect election in reserved seats. The issue once again came before the Appellate Division in 2004 when some leading women activists and human rights NGOs filed a writ petition (Farida Akter Case 11 BLC 156) challenging the validity of 14th amendment to the constitution and a law thereunder providing indirect election (in fact distribution of seats) to 45 reserved seats. But the court placed reliance on Ahmed Hussein and upheld its constitutionality. It was contended on behalf of the appellants that the indirect election is against the basic structure being opposed to the core essence of democracy. The court rejected the contention by saying that as per Article 28 (4) of the constitution the parliament can make special provision for the women and provisions for indirect election is not something undemocratic. It appears that the consequences of such indirect election over rule of law and good governance, governmental accountability, probability of spreading the nets of favourtism & familial lineage, spirit of women advancement as enshrined in the constitution, public opinion etc received little account from the bench. Through this verdict only the power of the ruling party has been accentuated in the parliament. Interestingly, in an immediate preceding case of Shamima Sultana Seema vs. Bangladesh [57 DLR (2005) 212] the demerits of reservation and indirect election were taken note of by the court. ABM Khairul Haque J. in his obiter dicta, held, “It does not seem fit in with the normal democratic legacy, rather raises a number of questions, such as to whom these members in the reserved seats remain accountable since they do not have any constituencies of their own. It is anything but democratic if they owe their loyalty to the existing members of the parliament who elected them. This system as it appears, instead of either helping the democratic process or upholding the dignity of the women, rather helps the party which is the majority in the parliament, to increase its edge over the other parties at the cost of women members who are so elected, rather selected in such a peculiar manner, unknown to any truly democratic country”. The learned judge doubted the constitutionality of amendments increasing the time for reservation and process of election. He observed, “Since those amendments (1978 & 1990) were made when the traditional constitution ceased to function, the legality of those amendments is open to question”. In fact, popular demands for equal representation of women in all spheres of national life is one thing and incorporation of a provision for reserved seats for women in the parliament in such a manner is altogether a different matter from a juristic point of view. It is submitted that in Farida Akter, an opportunity was created to reconcile the decision of Ahmed Hussein & observation of Shamima Sultana Seema by directing the government to bring a Bill providing for direct election in reserved seats of parliament. 1. Direct election in the women reserved seats should be held. To decipher the riddles of numeric equation (45 seats for 64 districts) the number of seats should be increased to 64. The demand of certain quarters of the society to make it 100 also has some substantiality because population and territory of some districts are considerably larger than other districts. 2. A Women Caucus in the parliament may be formed. The Caucus would be formed irrespective of party affiliation. This Caucus may be vocal on women's human rights standpoints and other policy formulations having bearing on women issues. The adoption and implementation of the proposed National Women Policy could be the first focus of such Caucus. 3. To increase people's perception about the role of female parliamentarians, their involvement in the parliamentary affairs need to be ensured. A female Member of Parliament may be elected to the post of Deputy Speaker. In making the list of panel members who conducts the session of the House in the absence of the Speaker or Deputy speaker, women members might be given preference. In the parliamentary committees their participation is required to be guaranteed. 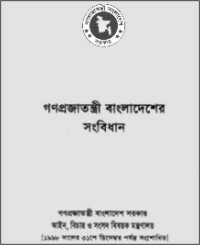 The writer is Assistant Professor, Department of Law, Northern University Bangladesh.